No problema. I posted a teaser to tide you over. Sorry it's such an awful photo but it's all I have at the moment. Stiggy - you may want to check these out. They are "Flo Fit" seats but look very similar to Recaro LSs. And they are brown corduroy. Not sure if they are any good compared to Recaros but might be worth some research. 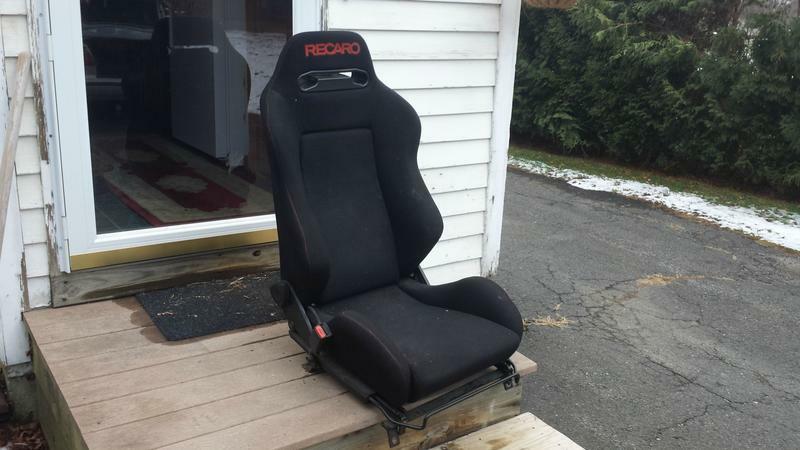 Seller seems to be a small-time seat guy; lots of Recaros and cover kits. I did see those! I tend to have my morning coffee while staring at seats - it's amazing what some people want for totally flat stained messes. I thought the ones above looked good - the only issue is that now I've moved the car towards a black interior so not sure if I want to revert. I guess changing the carpet back would be the only real pain. I think black and brown looks fine together, but that's just like...my opinion, man. You could do black carpet, dash, and headliner with brown seats and door cards. Or some variation thereof. Black is definitely better for resale value if you care about that sort of thing but brown does compliment beige or yellow exterior paint on these cars. Is going to a 16v head not an option? I know it adds more difficulties to the equation (mainly inlet/outlet mani's), but I think it would meet the flow characteristics you're looking for a lot easier than an 8v head. Always an option, of course, but not one I really expect to get into (let's mark these words for posterity, considering I bought the car saying "I bet I can get it running for a grand!"). Honestly, a big part of it is that I'm pretty attached to my hotside. There's no way I could get a 16v equivalent for what I got this stuff for, so I'm not too keen on going heavy out of pocket for header/turbo stuff again. 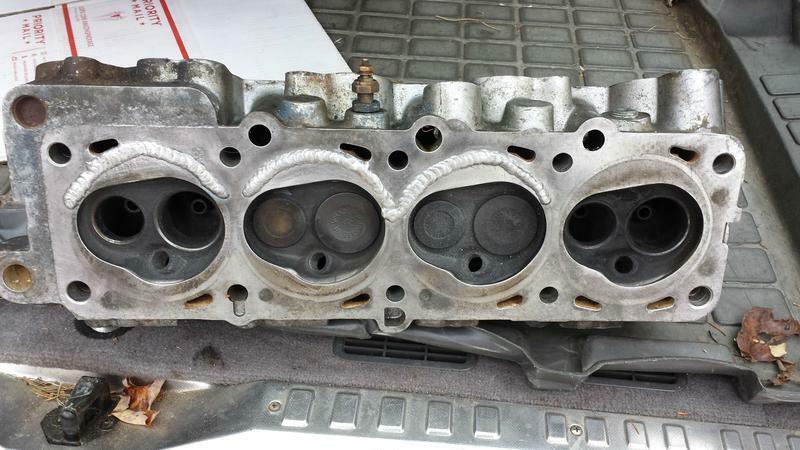 The other reason is that I really see no issue getting what I want from the car with an 8v head - I know 16v does more/easier but the power levels that start necessitating 16valve heads or $thousands in 8valve headwork are probably beyond what I'm interested in trying to get from a redblock. 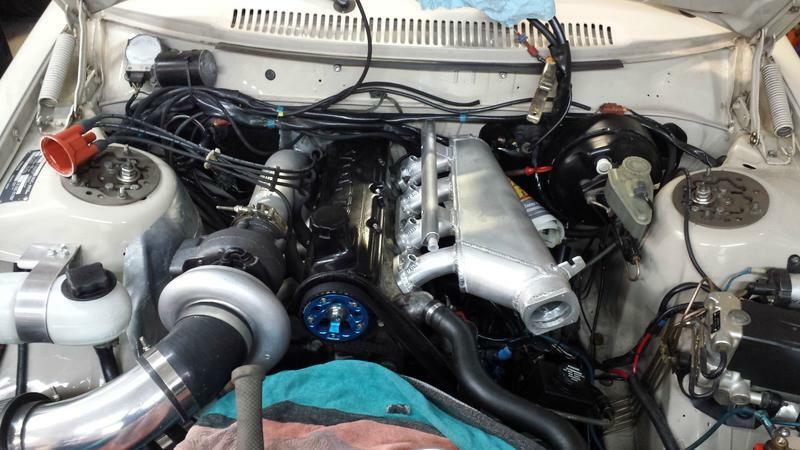 I look at the 16v conversion as a pretty significant shift in direction at this point, and if I was going to do that much re-engineering of the setup it'd be hard not to just want to give in and v8 swap the car. So, short of some crazy deal on a super hot 16v setup (or an ls6) falling in my lap I'm staying stubborn with the 8 valve for now. I try not to get too hung up on any number, but I do have a silly desire to be able to call it a 400hp car - it seems like that should be a possibility without getting too exotic with head work. I think I've seen guys here do like 340wheel with basically stock heads and big boost? Gathering information for the head, and will probably start getting things going in the next few weeks. 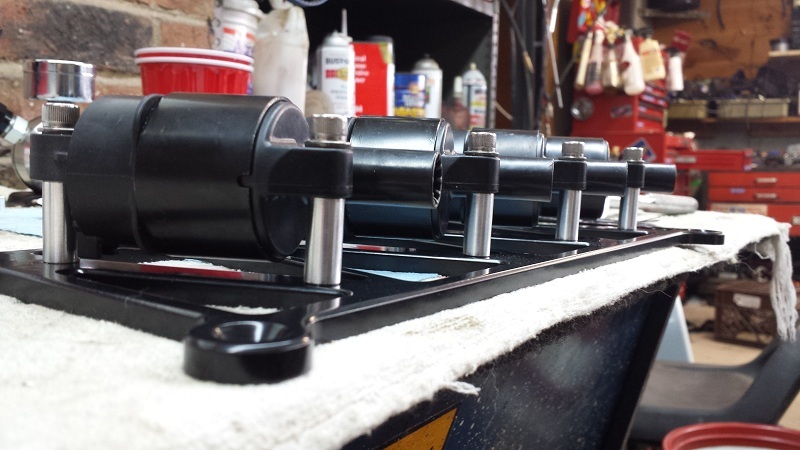 It looks like KL Racing is the only place for legit stiffer valve springs right now? Most importantly - the car is just fun as hell! ... but then you wouldn't have learned all about a car, how it comes apart and how it goes together, and you would not have become part of the great Volvo community, and have a car that you can be proud of, and people, who know nothing about the car, or what you did to get it there, give you thumbs up in. And,,,, you would have started wanting to mod the BMW, so would have ended spending more money, and,,, maybe you would have become one of those Corvette or BMW snobs. 8v sounds better anyways. You can do 400bhp with an 8v. I do like the noise it makes, I need to take a proper video. Very nice build! I just finished reading the entire thread and it's motivating me to work on the group-a this winter. 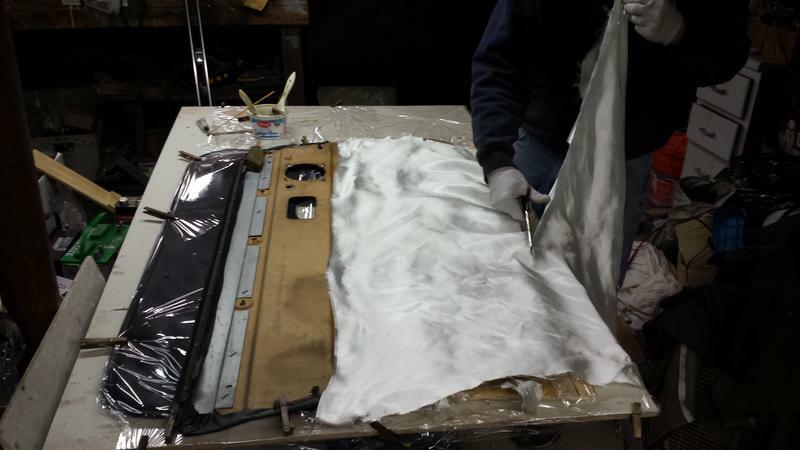 Have you thought about using the 262 Bertone chrome door sills? Of all the cars I've owned and motors I've built (v8s included) I honestly think my old 242 was the best sounding. Nothing cooler than a super cammed 8v with a header and barely any muffler. What is Santa going to bring you this year for your project car? 1/6/13 I bought this 1979 242dl in Hadley Mass. The original plan was to just get it up and running with a b230ft, but it has turned into a bit more of a project since then. Two years in the driveway, New Years was one year since first drive. I did take the car out of the greenhouse this weekend, and went for a ride with Mike Sr. since he hasn't been in it since I put in the boost controller. 18psi, dry tires and 30deg temps makes for easy wheel spin in 1-3rd. Dad said "pull over, I want to see you really light the tires up"... this can only lead to good things. I obliged in 1st and let it rip off the limiter (hey... junk motor). It sounded wicked and was awfully fun until SMOKE! 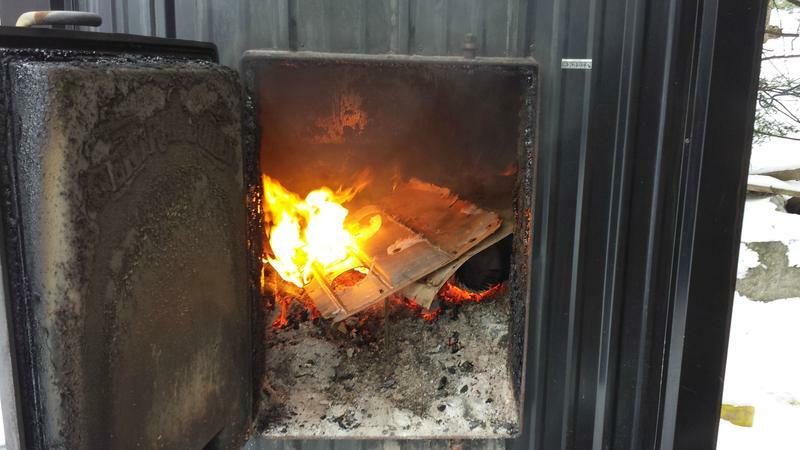 At least we thought it was smoke, until I smelled the coolant. Turns out the useless ScanTech heater control valve didn't appreciate the 6900rpm workout and failed in a spectacular fashion. Just a garbage part. The "waiting on road for tools" shot, happy anniversary baby. Not pictured: that feeling when you have a breakdown 100 yards from the houses you just did a big noisy burnout in front of. Was happy to have the seats settled on. I was shopping around like crazy and was getting discouraged - really hammered seats were going for big money, and nice ones were a lot harder to find then I expected. I had figured I'd end up getting the VW Recaro's, but even those all had smushed bolsters, ugly patterns, and were overpriced. 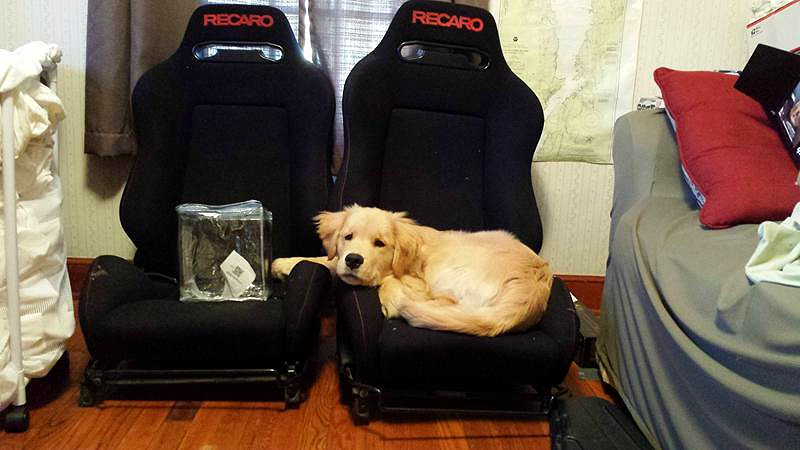 These are Recaro SRD's that are in really good shape, one just has a 2" cut in the bolster. I had to take a 5 hour round trip drive to get them, but they were a great deal and well worth it. Will clean up good with a shampoo, and feel great sitting on the floor making engine noises. After taking a few months off because of getting the puppy I posted earlier, I'm finally starting to work on the car again. I put in power door locks which should be nice to have, and started thinking about the interior again now that I have the seats. 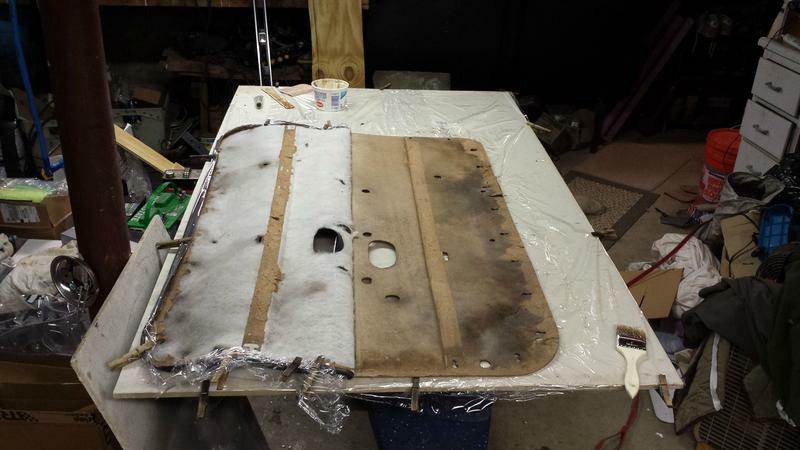 With the locks done I want to finish the doors so I got into doing something with the door panels I have. I have two sets: the brown ones that came in the car, and a black set I grabbed from a tbricker. Obviously I'm going for black, but the cardboard panels were really suffering. The original brown set had one that was completely shot, and one that was the best of the four. 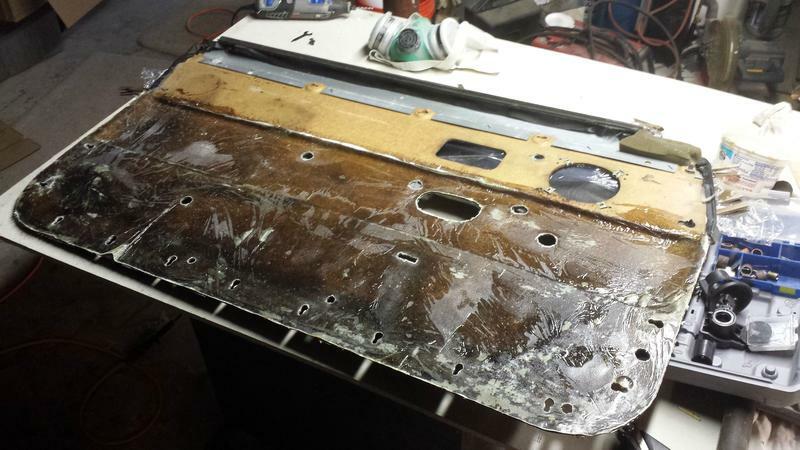 After picking at the really junky ones a bit I decided I'd peel the brown off the best panel, and transfer over the black upholstery from the worst of that set. This is the best panel after skinning. I wish I had two like this. I noticed this one panel was completely made of cardboard, where the other 3 had a pressed metal piece for the upper shape. I guess they must have done it for strength, but it was weird that the '79 had one of each kind originally. This left me with the other black panel, which was in pretty sad shape. On the full cardboard one the piece around the door lock broke off so I had to glass it back together. This one got a big sheet of glass on each side. 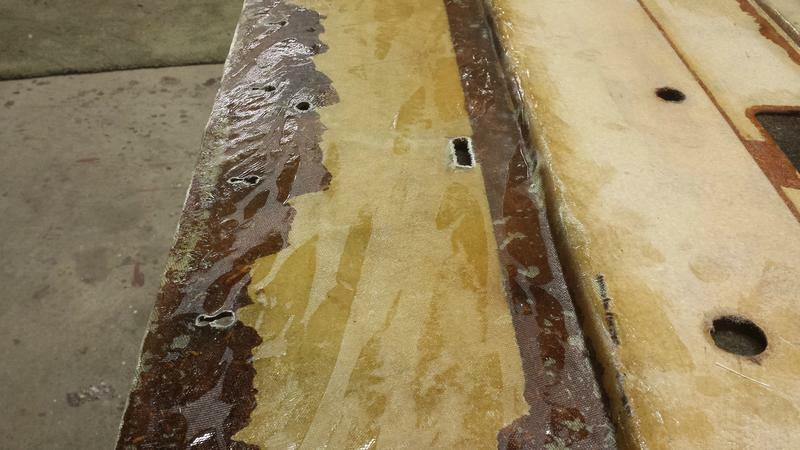 That panel was all warped and wavy, so we needed to get it pressed flat while the resin cured. 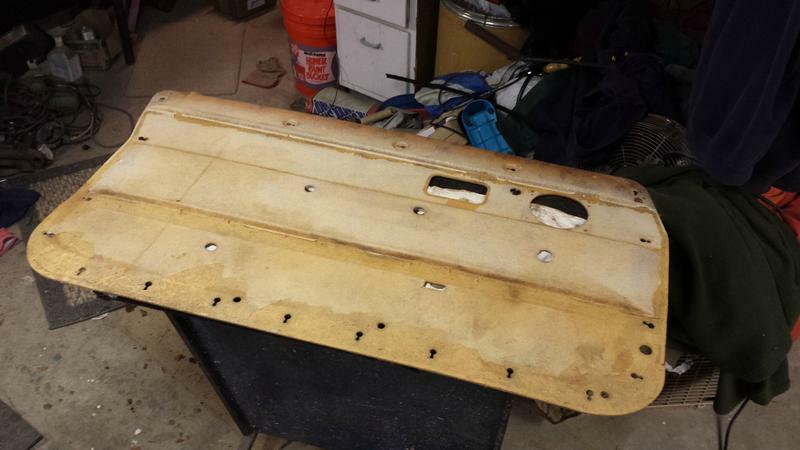 We cut pieces of 1/2" ply to fit the shape of the panel and used every battery in the garage to squeeze the hell out of it. 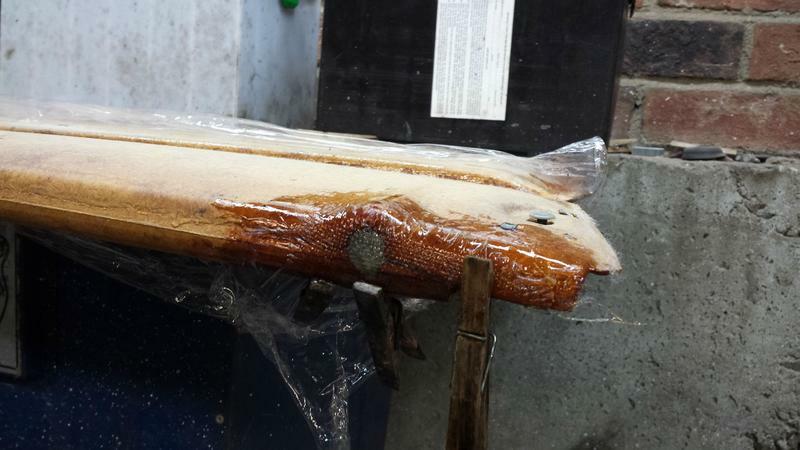 This got it nice and flat and also helped squeeze the resin into the punky cardboard. A few days stinking up the basement later, out of the press. It cured really nicely, has flex but is pretty flat and a lot stronger than it ever was before. Few bubbles from shifting the batteries around but it looks good. Trimmed it up and used a dremel to cut out the holes. The key holes for the clips turned into nice hard resin pockets so it took a while of shaping, trying to fit the clip, shaping a little more, until it grabbed the clip right. The better panel all cleaned up, came out awesome very happy with this. I'm going to bring everything down to an upholstery shop and see if he can do the glue for me. If he can get the vinyl stuck down decently again I'll call this experiment a success. Once these are done I'll probably start taking a look at adapting the seats. Then it's aux gauges/center console, steering wheel, shift boot and I'm pretty much there inside the car. 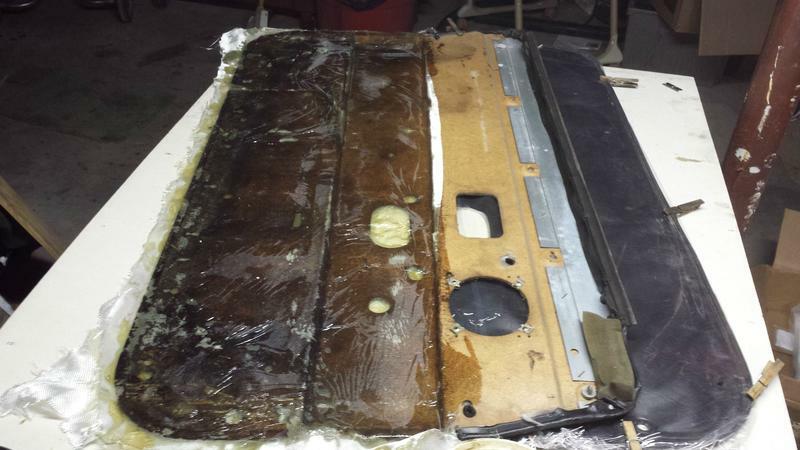 Oh I still have the brown back seat, I think I'm just going to bomb it with black SEM dye and call it a day. Last edited by Stiggy Pop; 01-18-2015 at 07:12 PM.. So I haven't been working on the car a lot but I have been doing a lot of reading and trying to get plans together for what I want to do this year. I had decided in the Fall that I wanted to upgrade the megasquirt setup I'm running and replace my messy adapted lh2.4 harness with a nice clean custom one. I also wanted to upgrade the ignition and get rid of the distributor. Thought about it a while and the new Microsquirt was an inexpensive, clean and simple option. It's a nice little package, and has a nice ampseal connector which solves my issue with the comparatively crappy ms2 db37 connector. Also Kenny told me that the microsquirt has a much better VR input circuit then the ms2, which is good because I'm planning on continuing to use the stock flywheel sensor. So, I've got a microsquirt V3, 8 foot harness, d514a coils, and a growing pile of connectors to build the harness. I'm a little intimidated by it, but should be a rewarding project. I need to sit down and draw my wiring diagram, get the last few items together, and start thinking about mocking stuff up. The plan is to set all of this stuff up on the engine that's in the car so I can work out the bugs and get everything running smoothly. That way it's a proven system when I want to put in the good motor that needs to be broken in. 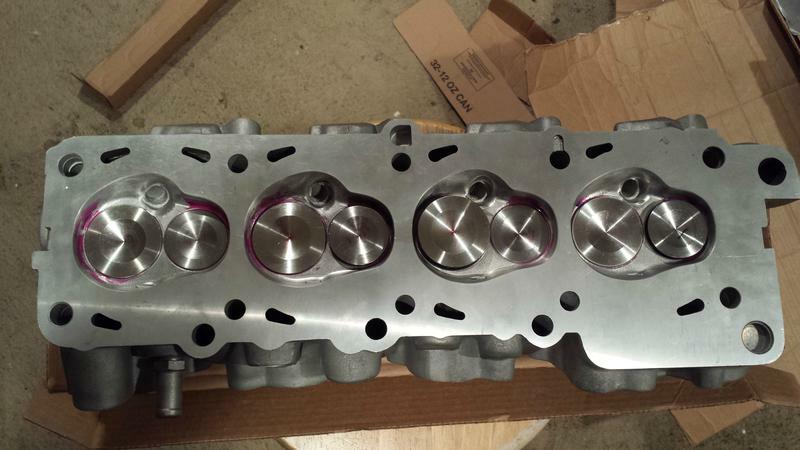 With the built bottom end I started thinking about finishing off the whole 8 valve setup, and decided to do a head for it. I had started down the road with the 531 from the Penta motor, but had shelved it when I realized it was going to need welding around the chambers and repair on the #4 exhaust. I started planning on using a 530 and doing port work and having 46/38mm valves put in. After I took a closer look at the 531 next to a 530 I decided that the advantages on the 531 were worth working a little harder for, so I gave it to a friend who said he would take a shot at doing the welding for me. 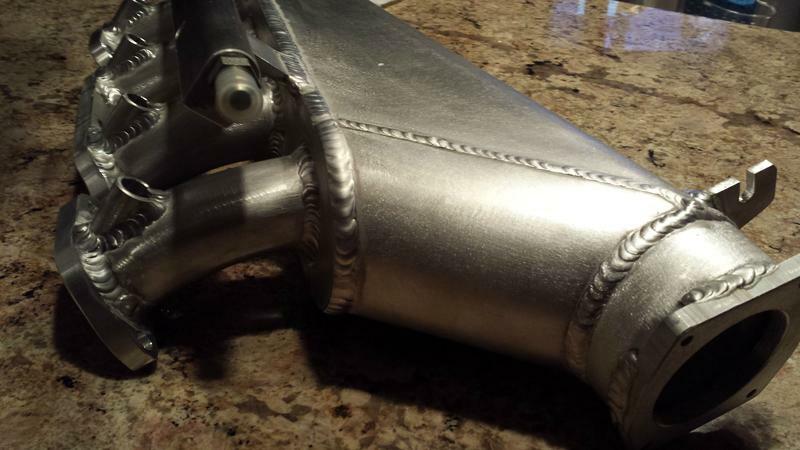 The welding around the chambers came out great. He was not successful with the #4. Whatever repair work that had been done here in the past had a bunch of garbage in it that was preventing him from getting a good weld on it. The main problem is that the port is all corroded, and as a result the face is .050" lower then the rest. Since I wasn't going to be able to build it up with weld, we talked to a machinist and decided to cut the port back flat and make a spacer to get a flush face for the exhaust manifold. It was a good solution for making the free head usable, even if it wasn't an ideal case. But... as I started to really get going on the build, I started realizing how much it was going to cost to set it up. Had to buy valves and springs, deck the weld on the head back, machine the port, get the valve job done for the big valves in stock seats. That was going to cost real money, and that was before I even got into paying someone to shape ports for me. I started to get hung up on investing that much money into this core. Funny, the top of the page has me in October saying and RSI stage 2 head is more then I need, and here we are in January. After hemming and hawing over the 531 I decided to just tell Paul who I got the block from that I wanted his RSI head. Turns out I had just missed it. I was kicking myself when this one came up in For Sale so I jumped on it. Brand new, with a stage 3 cam, shim under bucket, 48/40 valves, really nice port and chamber work. Pretty impressive, a lot more then I would have gotten from the 531. So on the same day the head showed up, I also got a box I was looking forward to from Nathan. Way better then Christmas. I'm in love with this thing, I can't wait to see it in the engine bay. It's a really nice piece of craftsmanship, weld work is really nice. Been spending time getting things together for the microsquirt/wiring project. I've got all of the connectors now, and bought a nice set of ratcheting crimpers. 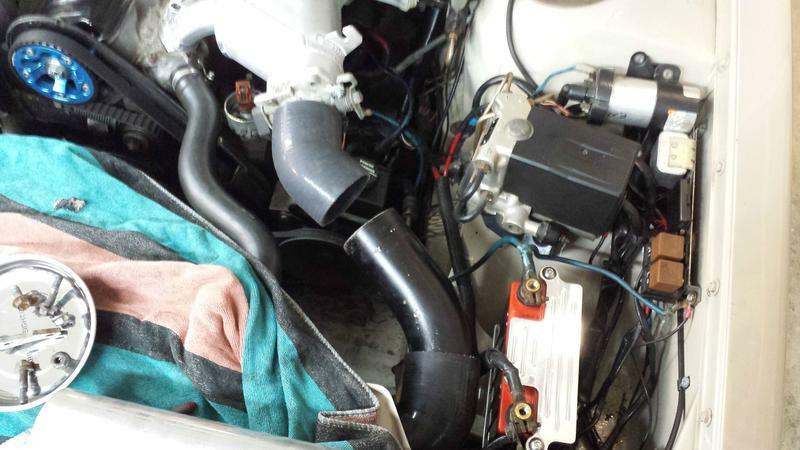 In order to get going on the harness, I needed to get the new intake in to mock things up. I was excited to drop it in, I think it looks killer in the engine bay. Helps balance the big turbo. 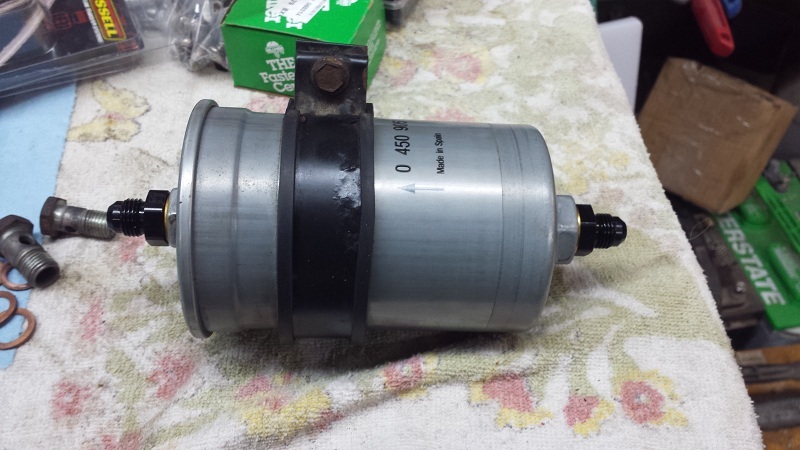 I had been preparing myself for the possibility I'd have power steering pump problems. I've never seen one of these in a car in person, and every post I read people said you needed a remote reservoir pump to fit. Happy to find it's a perfect fit with the new style pump and a non-AC bracket. The cold side piping won't be too complicated, though it's a shame the nice piece I made last year isn't going to serve a purpose anymore. 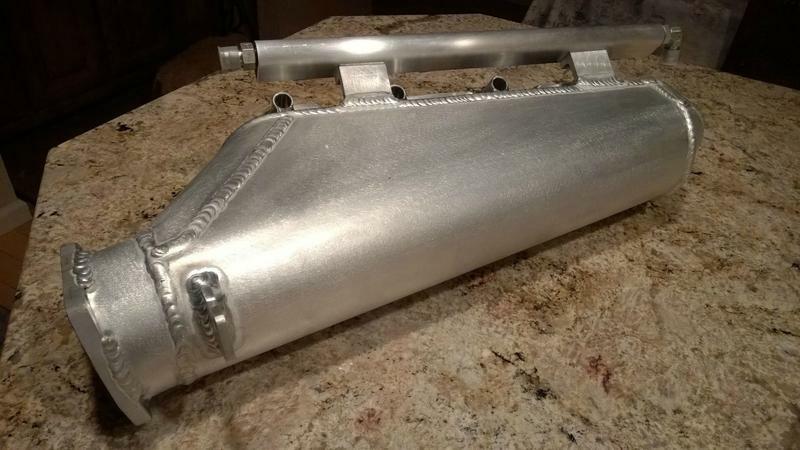 I ordered two aluminum 45's, I may try to have a straight coupler off the throttle body and do an s-bend with the pipe, might look nicer than having the silicone 45 off the intake. 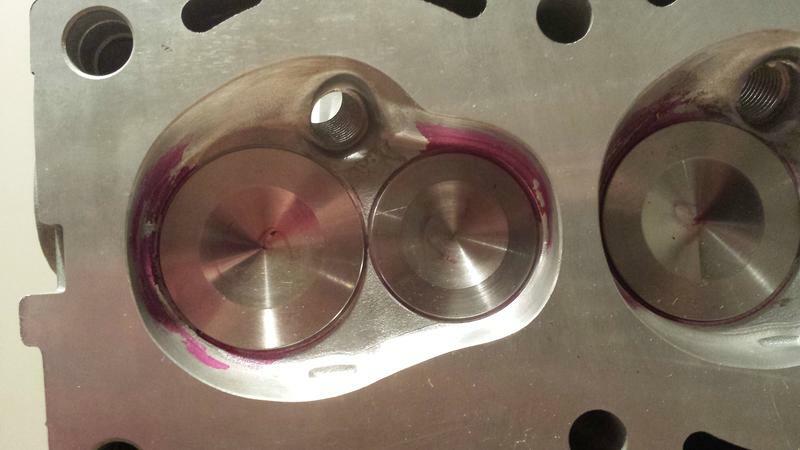 A 3" coupler doesn't really fit the 960 throttle bodies (too big). Is everyone just using 3" silicone and cramming it on with a clamp like I was doing last year? Would be nice if it was a tighter fit. 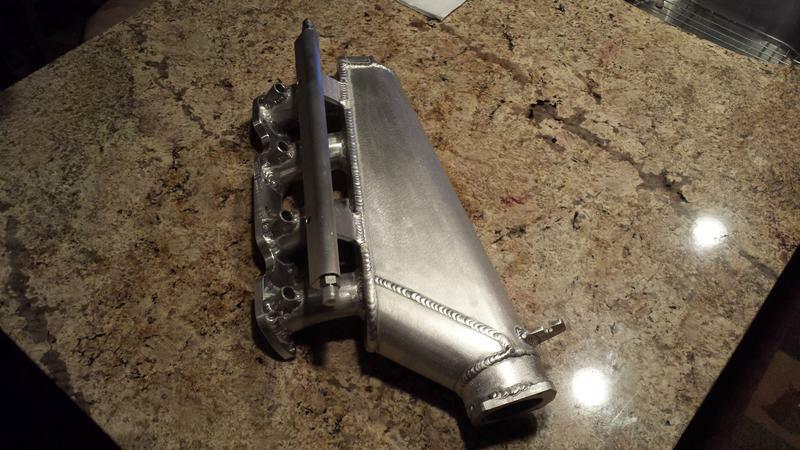 What should I do with the intake finish? Leave it as is? Get it ceramic coated to match the header/turbo/downpipe? I think polishing would be too much shine... though it'd be pretty. 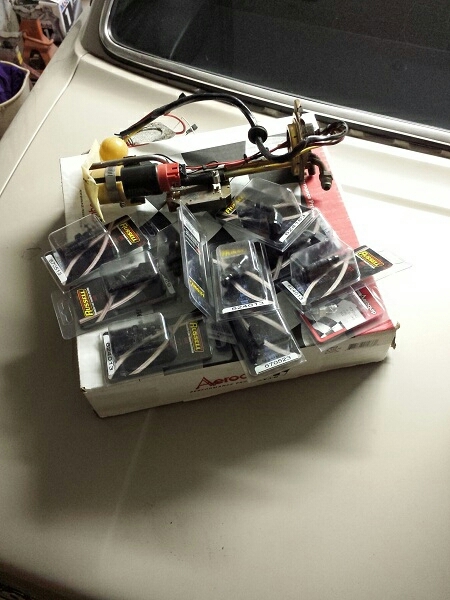 Going to start running wire tomorrow. Pretty good idea of what we're doing, so time to just get in there and start figuring it out. 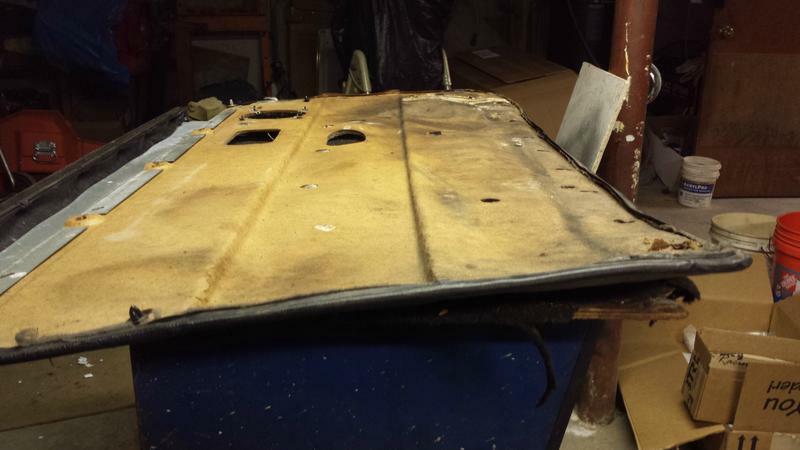 Last edited by Stiggy Pop; 02-13-2015 at 08:47 PM..
Looks great--I vote to leave the manifold finish as-is. For the 960 throttle body, I have a 3" coupler on mine and it seems to fit fine (although my TB isn't as easily accessible so perhaps I just didn't notice). Have fun with the wiring! That part is so gratifying to clean up. I like the sanded finish on it now too, wonder if there's a way to protect it without changing it. The 3" does fit, it's just a on the loose side (compared to my 3" piping that needs silicone spray to slide in and out easily). I had a fat t-clamp on it before and it worked so I just wont' worry about it. SO, going to sidetrack a little and do the fuel system I guess. I have a sending unit with an A340 pump and a -6 on the pressure side. So project this week is to figure out what I need for lines and fittings so I can put the new pump in and plumb the upgraded fuel system. It's on the list anyways, and this will allow me to move the car around while I work on all of the intercooler piping, throttle cable, and wiring. Going to try and get my fuse/relay panel setup nailed down as well, that way I can wire the new pump properly when it goes in. February already? I'm starting to feel the pressure for Spring. 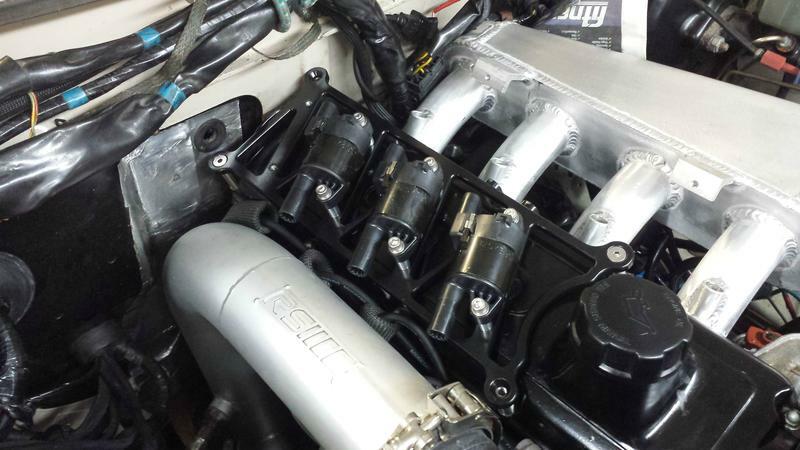 That aluminum intake WILL oxidize and look like crap after a while. Probably quicker than you think in our awesome climate. 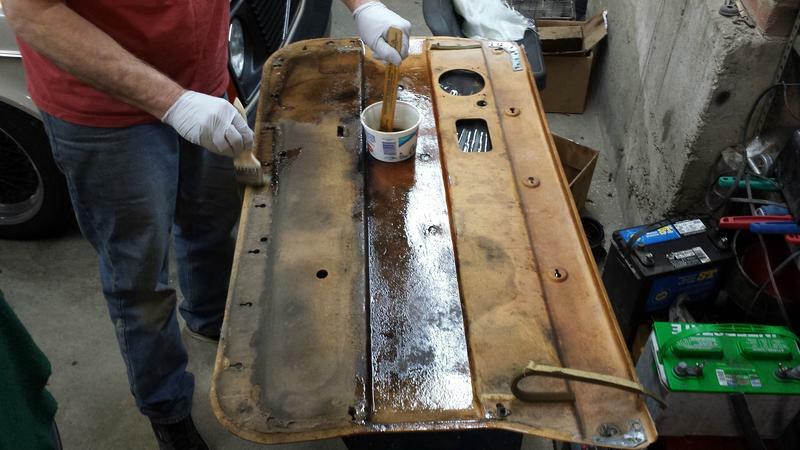 Is clear, or matte clear, powdercoating it an option? It's an impressive piece in it's raw form and painting it may be a sin. Working on it! I'll definitely be ready to swap that engine in when the snow melts. Yeah, I've been thinking about that. 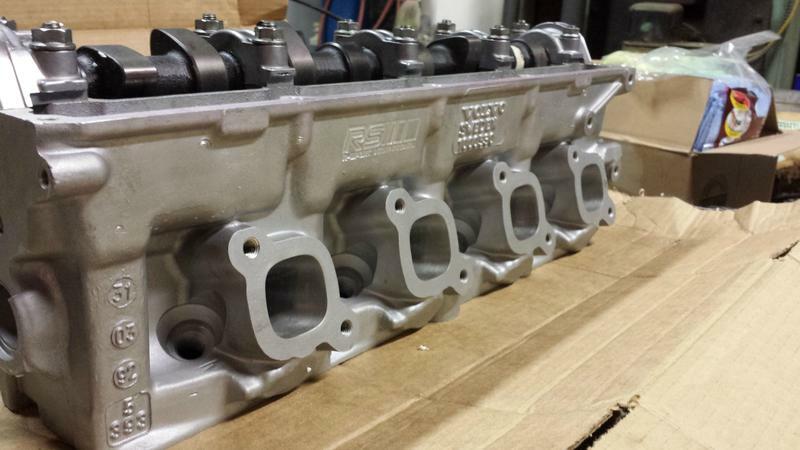 I remember what my raw aluminum valve covers used to end up looking like. It looks great as is, maybe a matte clear would preserve that - have to look into it. 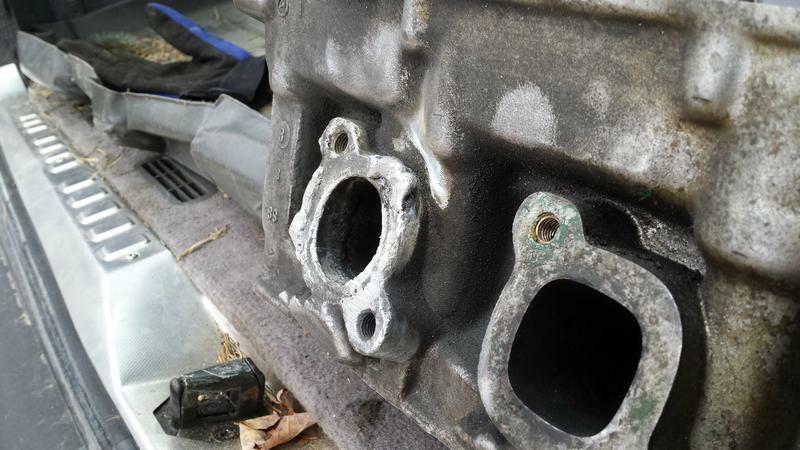 I know I blasted and gloss cleared a cast intake and hated it. I like the finish from the ceramic coating on the exhaust stuff, so I'm probably going to look into that when it's back off the car for the engine swap. I still think of you when I wonder about getting around to that inspection sticker! 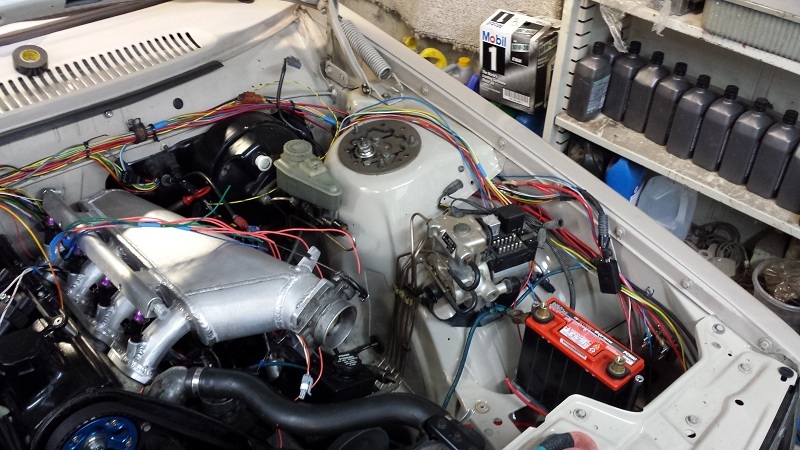 We had this great thought that I'd build my new engine harness in parallel with the old one. Didn't take long to realize that wasn't realistic, so I finally stopped farting around and got into it. Pulled the stock harness out and cut it open to keep a few things, then yanked the rest out. Engine bay looks better already and it was satisfying to get rid of the clutter. I'm hoping to get most of the wiring done this week. I took out a running system so hopefully I don't regret this! I bought a coil bracket from Roger Dee, using it with the d514a coils. 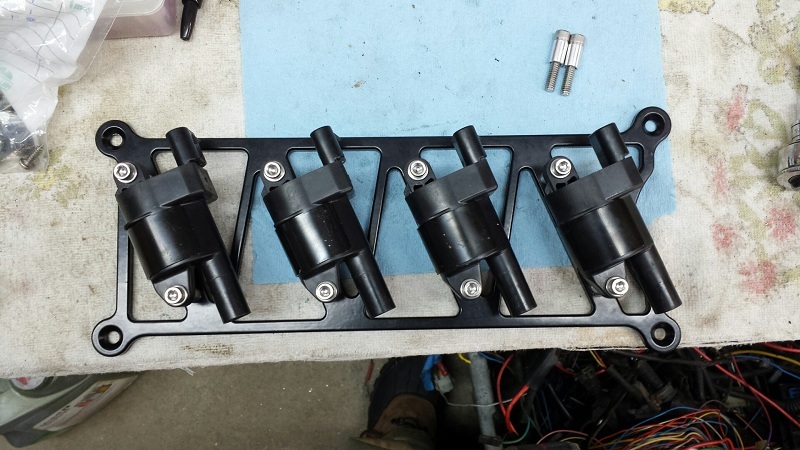 The coil mounting tabs are offset, and the closer side measured out right for the spacers and bolts he provided. I bought it without thinking more about it, but when I tried to mount them it was pretty obvious it wouldn't work. With the coils mounted that way the connector is to the left, that's a no go with the firewall, not even close. Bracket is really nice though. So, I've got to flip them, which means the spacers and bolts aren't long enough. Luckily Roger is going to hook me up and I should have it all squared away soon. On the plus side the location for plug wires is better with them flipped over, I'll have to buy one of the cut-to-fit kits. Got a pile of hose and fittings to do the fuel system. Also need to setup a throttle cable, clean the throttle body and build the intercooler pipe but I'll worry about the harness first. I heard you had company coming and couldn't work on your car tomorrow! oh, wait a minute, that's my heated garage spot your car is in - damn! Well, in keeping with tradition the EMS swap has taken about 6x longer than I anticipated and cost about 2x as much (mostly from buying tools to build a harness properly). But I'm happy with how it's going, I feel like we're doing things the right way, and I'm learning a TON about this stuff. This is the first install like this I've done, since the ms2 was really just swapping the system from the gold wagon, so every piece of it is an education. That's really bogged me down at certain points, but it's been pretty enjoyable. I think I spent a lot of time up front trying to plan every single turn of wire and crimp out in my head, when I should have just gotten into it and let things figure themselves out. It's actually less intimidating to deal with it hands on then it is to sit on the computer at work and read about it (work's been slow). It takes most of the guess work out of it (once you're confident in the dies and how to place things). But it makes perfect crimps, and things turn out a lot cleaner. 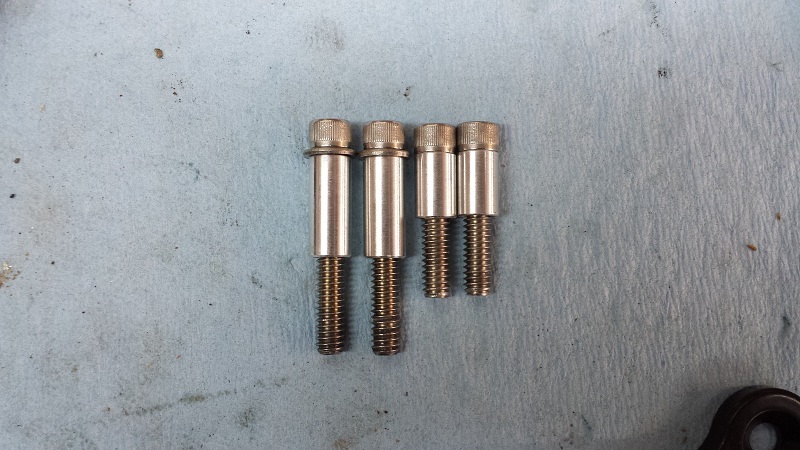 Here's some Bosch pins made with the crimper, they came out as good as the ones I took apart and this was the first connector I made. 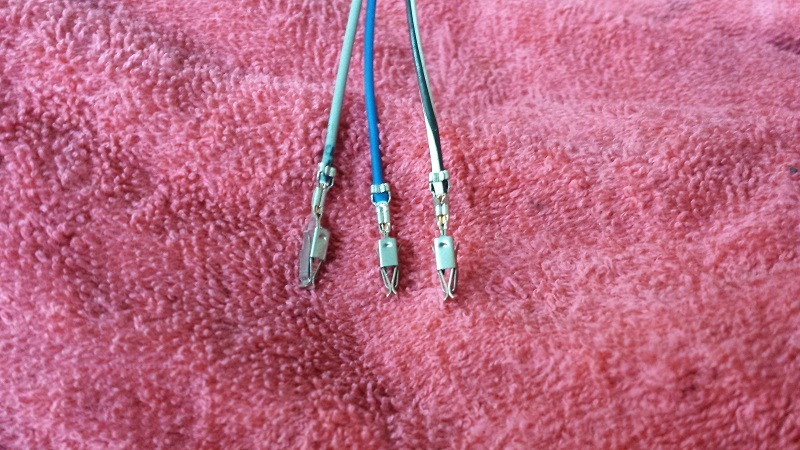 It was also helpful to free myself from the expectation to make some perfect weatherproof heat shrunk glue booted aircraft quality wiring harness. 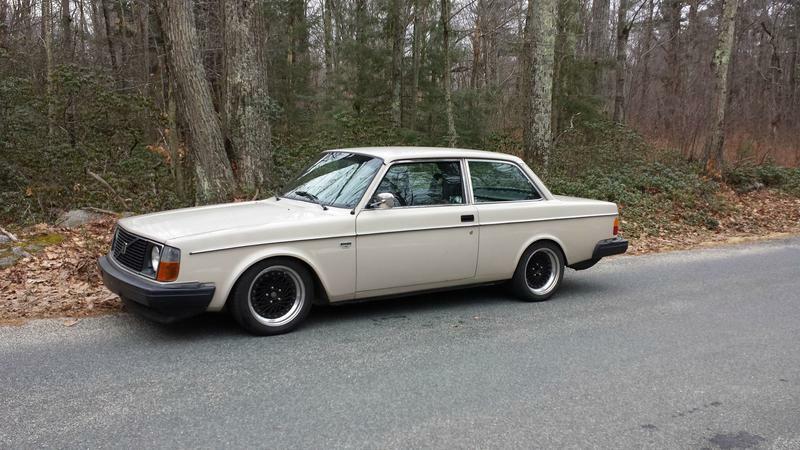 I'm still trying to do it neat, clean, and professionally, but I'm trying to be a little more realistic about the fact that I'm building a 35-year-old Volvo to drive on the weekends, not a GT3 car. Had a few people ask me why I'm not using some big mil-spec bulkhead connector, and I wanted to at first, but in the end it was just going to be unneeded cost and complication. When the engine's out I'm going to hang the harness in the car anyways, so why introduce all the complexity and failure points? I work in aerospace and I see a lot of removal reports for bent connector pins, not so much for rubber grommets. KISS in that case. 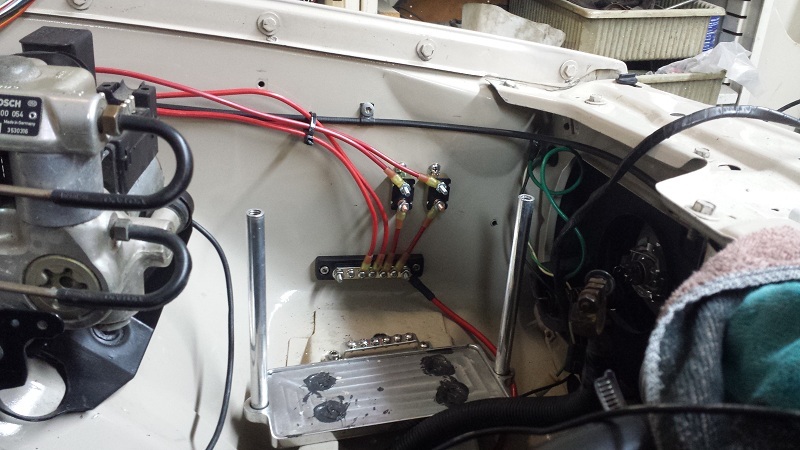 The 12v side of the harness is done, using the GTO fuse/relay panel left over from my Dad's ls1 v90 project. We've got a main relay for the micro, then cube relays for fuel pump, coils, injectors and accessories (idle valve, wideband etc.). I wanted to get rid of the mess on the driver's side fender so I'm going to move/hide the headlight stuff a bit, and I ditched the stock 12v distribution thing for a busbar tucked down behind the battery. One circuit breaker is dedicated for the fuel pump, the other is on the line that feeds the rest of the microsquirt stuff. 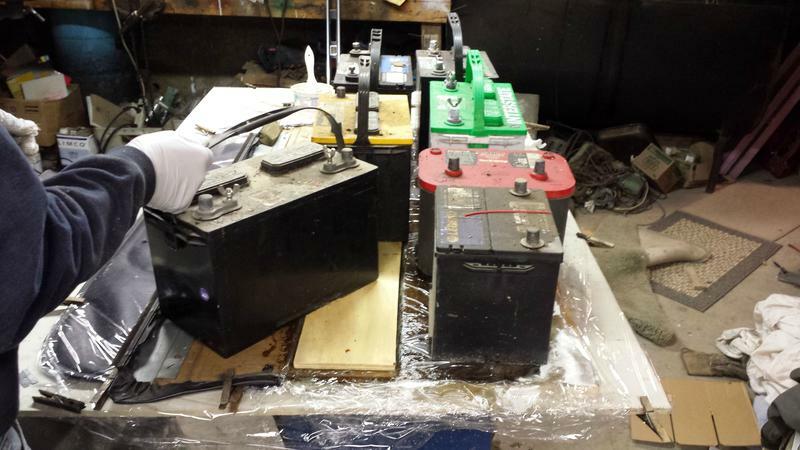 I'm also going to add a battery shutoff switch when I make new battery cables. In the interest of re-looming things more neatly I've got all the harnesses cut open and am moving/trimming/eliminating where appropriate to neaten things up. This is my anti-wire tuck photo. Looks crazy now, but I can already see how much cleaner it's going to look when it's loomed. 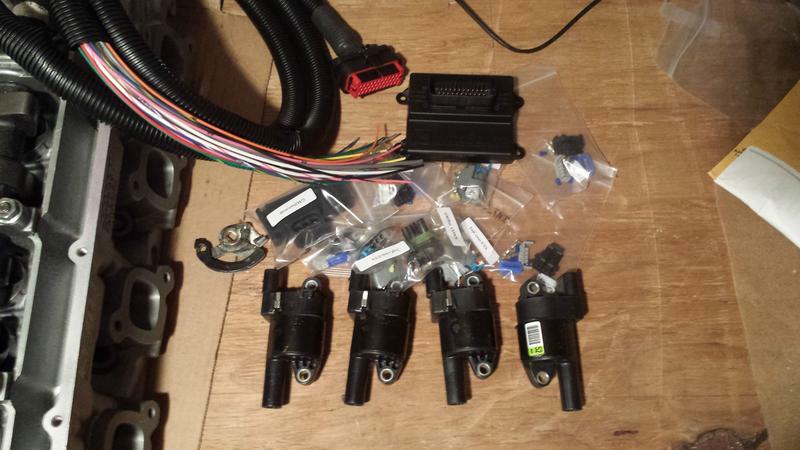 Left to do now is: make up connectors for the injectors, coils, wideband, and MAP sensor, new wiring for the big fuel pump, mount the fuse panel/micro/map sensor in the car. Getting really close to powering things up. I at least expect to hook the micro up to the laptop this weekend and calibrate sensors... that's the goal at least. Roger Dee got me set up to mount the coils properly, after my issue with spacers and clearance in the last post. 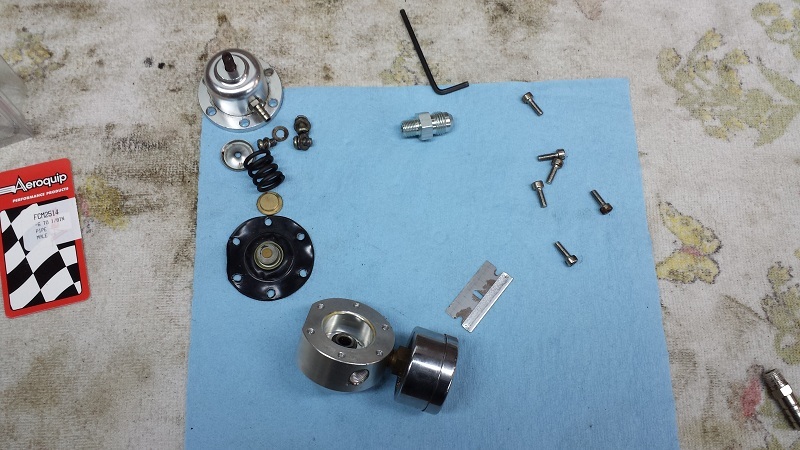 This is relevant to anyone trying to use Roger's ls2 coil bracket with d514a coils: you'll need spacers that are ~.850" and bolts that are around 1.75". This allowed me to flip the coils over, which puts the connectors towards the nose, so they actually fit in the car. Big thanks to Roger for sending the hardware gratis, even though it was my miss on things fitting. Forgot to take a pic on the engine but they look really slick. difference in hardware from the "old style" (square body) ls2 to the d514. Pretty obvious where you'd have a problem if you flipped them over with the connectors to the left. 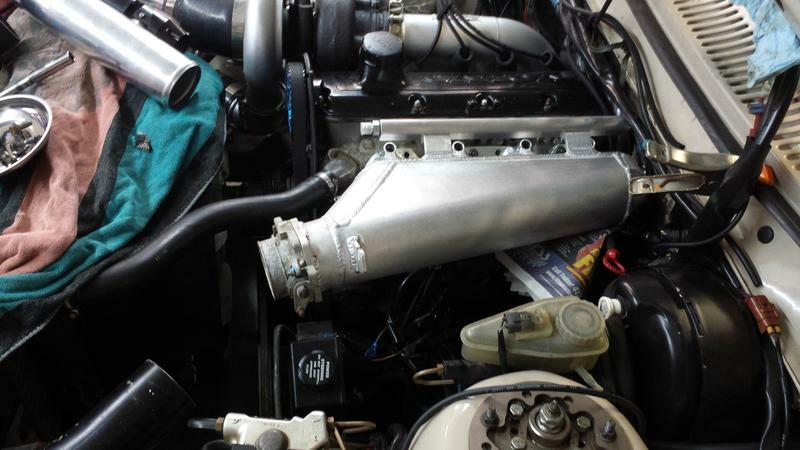 Need to buy some spark plug wire kit, and hope that I can clear my downpipe without having to move the coils up the bracket towards the intake (it is a wee bit tight). One side track I got on the past few weeks was how to handle the FPR with the -6 hose and fittings. 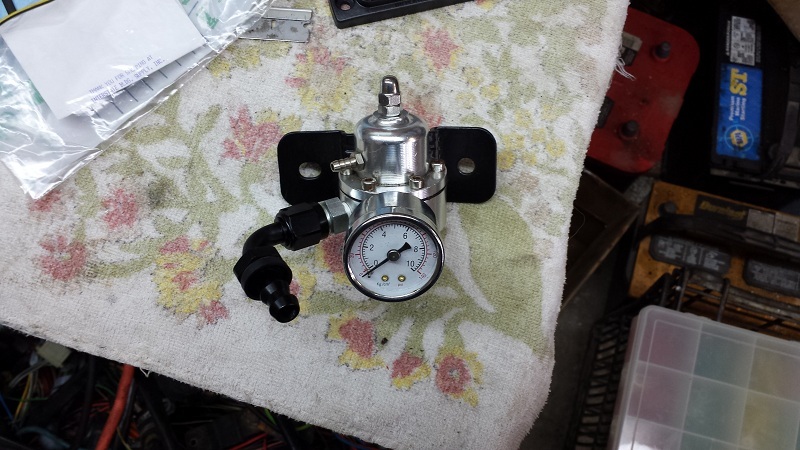 I have been using a Cosmo adjustable regulator that I carried over from the gold wagon, which was nestled in a kludgey loop of fuel lines running every which way. I like the regulator though because it's a: free, b: has a gauge. So, I had to figure out what fitting I could use to put a -6 on the pressure side. 1/8" NPT was just a bit big, would only start half a thread or so before binding. I called Cosmo and they actually couldn't tell me what the threads were, guy on the phone said "I think we use metric threads"... less than helpful. 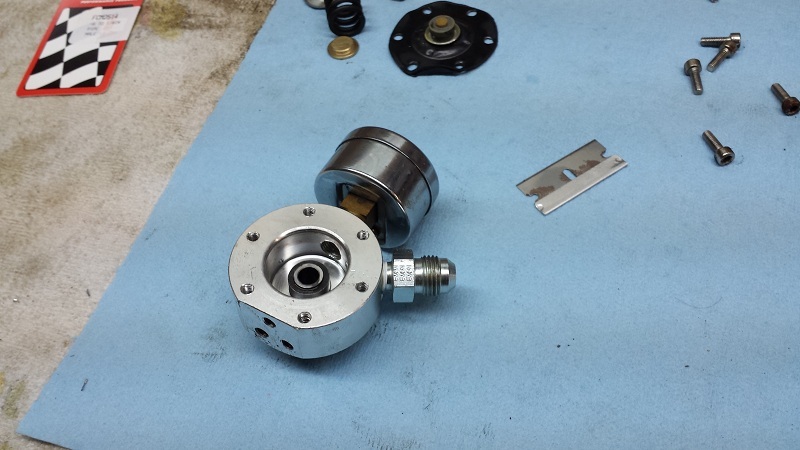 In lieu of that info I'd need to tap it out to 1/8" NPT, so I asked about the gasket to seal the two halves... NLA. So I had the option of tapping it out assembled and hoping I didn't bugger it up with chips, or take it apart and hope I could reassmble without leaks. The gasket was a plasticky piece that was still flexible so I took it apart. Played around a bit with placement ideas for it, I wanted it off the engine and somewhere I wouldn't have fuel lines criss crossing stuff. I found a good spot in the back of the driver's side strut tower, tucked away into the corner near the hood hinge. Here it is reassembled on a bracket to fit the new location. This will let me feed the front of the rail, then I can send a fuel line from the back, across the firewall, into the FPR, then snake the return right down under the booster. Hoses will be nearly invisible and should be pretty slick once I get around to finishing them. Getting there! Going to be a big celebration when this thing runs again. Last edited by Stiggy Pop; 03-04-2015 at 10:45 PM.. I like the butterflies and flowers on your shop towels! 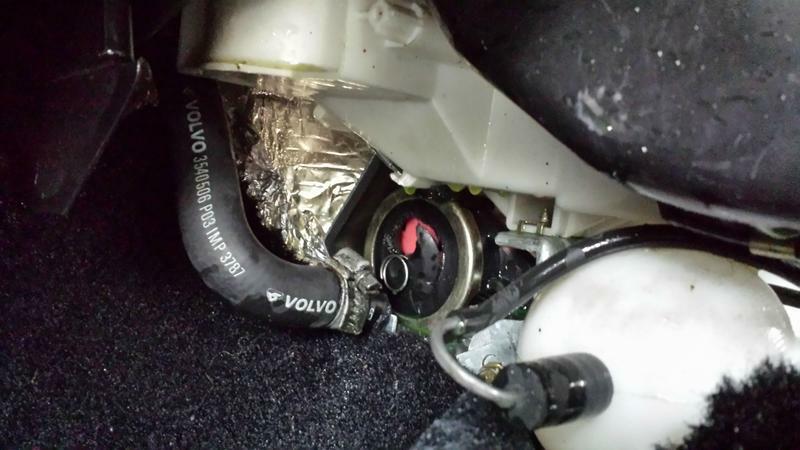 Is that a Volvo muffler bracket you modified for your fuel pressure regulator? 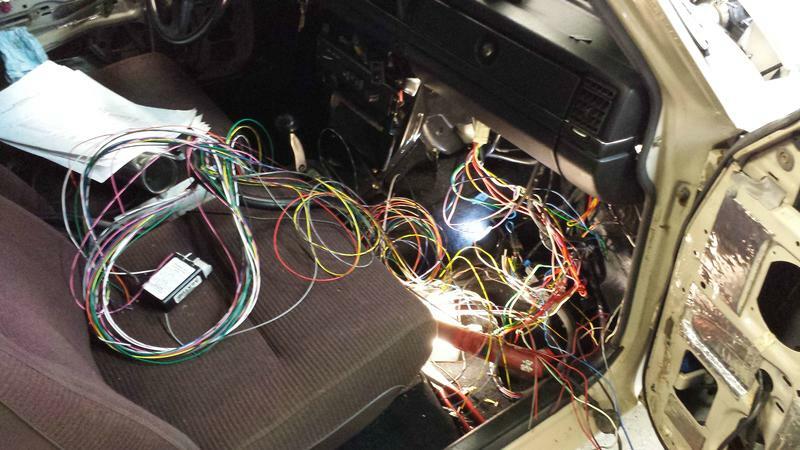 I have to commend you on the work that you're doing with the wiring. You really dug in, and are doing it right. When you look at the whole thing it is overwhelming, if you deal with it one wire at a time, it is doable. You're learning a ton about the car, the engine management system, and breaking big jobs into small ones. Here's to no smoke when you power it up!